If you’ve ever traveled with a DSLR you might have noticed that over a long period of time it starts feeling both bulky and heavy. Or, have you ever worried that when filming a video while standing over water that your DSLR will just fall in, and be absolutely destroyed? With the best action camera you don’t have to worry about any of that. An action camera is the perfect choice for anyone who loves spending time in the outdoors, or anyone who enjoys taking part in sports, including activities involving water. Not only are the majority of action cameras waterproof, but they are also shockproof. This makes them an excellent choice for outdoor enthusiasts who find themselves getting caught in the rain on a frequent basis, or even with outdoor enthusiasts who enjoy water sports, such as surfing and kayaking. Choosing an action camera that suits you can be quite difficult, as the market is full of them, but the qualities that the best camera for action shots will have will all be quite similar. In this article, we will give you an overview of the aforementioned desirable qualities in an action camera. Then we’ll move on to the top 7 action cameras available on today’s market. Action cameras are a product that not many people outside of the extreme sports industry have purchased, but they are an incredibly good option for literally everyone. Whether you are into extreme sports or you are just looking to document all of your activities, an action camera could be the best purchase you ever make for your traveling adventures. But, there are a lot of different features that separate a bad from a good action camera. A few of them that you should pay an especially close attention to are the following. One of the most important things that you should focus on when choosing an action camera is video quality. This is because you want your video footage to look as good as it possibly can. You can generally find two different options for video quality in action cameras. 4K video resolution is currently the highest resolution option that you can find on the market. If you own either a 4K television, or a 4K laptop/computer then you should aim for getting a camera that has the ability to shoot in 4K. It is rare to find a camera that shoots at 4K with a quick FPS rate, 30 FPS is the most common, but there are a few notable exceptions. 1080P is another excellent resolution option, and it is the resolution that most people use to view footage. When looking at action cameras that shoot in 1080P, you will find that many have the ability to shoot at 60FPS or even higher, and the majority of these have built-in image stabilization. Most of the action cameras on the market can be used with numerous different mounts and accessories, so you can tailor them to your own requirements. For example, if you wanted to mount a camera directly onto your chest to film your route while hiking, you can. Although action cameras in general are known to have great mounting capacity since you can mount an action camera onto almost anything, the compatibility differs from camera to camera. With the most portable action cameras, you can mount them on pretty much everything from skydiving equipment to your pet’s collars, just to see what they get up to when their owner isn’t home. On the other hand, other action cameras can only be mounted with a special tripod or general things such as a bike. Consider which kind of footage you plan to take and make sure to pick an action camera that has a suitable mounting compatibility for that. Another thing that you would want to consider when choosing an action camera is the size of the camera. Always choose the most convenient size for you, never larger. Most action cameras are small enough to fit right in the pocket of your pants, so you will not have to struggle to find a space in a large bag, like you might have to with a DSLR. You can simply put the camera into your pocket, and pull it out when you want to use it. This compact nature is one of the best features that an action camera can offer, and it really is what the camera is designed to offer you. The small size also means that the cameras are lightweight, and can be left strapped on without you noticing. When it comes to action cameras, another thing that most people have to consider is how durable the camera is. This durability can be seen in a variety of different features, like waterproof and sturdiness. The vast majority of action cameras are completely waterproof up to a certain depth. They also are usually shockproof. You can purchase a waterproof housing unit for most cameras, although this isn’t always necessary (unless you’re diving). The range of depth for most cameras ranges all the way from 10M up to 50M+ without a housing unit. You might find that it isn’t a necessary accessory for your adventures. One thing that everyone should be aware of when purchasing an action camera is that they don’t have a long battery life when being used continuously. Most only offer 1 – 4 hours of continuous footage, and the battery does drain quickly. How quickly the batteries drain is also dependent on the usage of the camera, and factors such as how high the camera’s resolution is currently set, and whether or not you use the connectivity features that are available with your camera. Luckily spare rechargeable batteries are usually quite cheap to purchase online, so you should always have a spare or two with you. On the other hand, there are also action cameras that come equipped with a non-replaceable battery. Make sure to pay a close attention to the battery type before you purchase the camera. You also need to consider the connectivity features that you require the camera to have, for which an excellent example would be the Cloud system that is offered by GoPro. Most action cameras are Wi-Fi enabled, or are accessible via Bluetooth. Using these features you can easily upload and transfer any video footage that you film directly to another device. Make sure that you take into account what you need to get out of the camera. Do you want to view the footage immediately on the device, or are you happy viewing it when you get home? Not all action cameras have a screen, although most modern ones do. One other thing that you should consider is the memory cards. To see the full performance of an action camera, you are going to need a memory card that has a fast writing speed, otherwise your footage could end up looking quite jerky. This jerkiness is caused by the memory card not writing the footage fast enough, so it has to skip frames to keep up. When it comes to choosing an ideal action camera, it really depends on what you plan on using the action camera for. But one thing that should always remain the same is how easy the camera is to use. This is because the people who use them for extreme sports need to be able to use them quickly. But, you also need a camera that brings you all of the features that you need to capture the footage that you want to capture. One thing that you certainly don’t want to miss out on is image stabilization. All of the cameras featured on our list have on-board image stabilization, so you won’t end up with shaky footage that you have to try and fix after. The action cameras that we are reviewing are suitable for everything from hiking to high adrenaline activities. They offer all of the features that an ideal action camera should have, as well as offering great value for money. 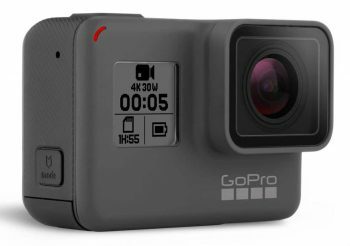 Description: The GoPro HERO5 Black Action Camera can be used to shoot incredibly high-quality 4K footage, or to take 12MP photographs. When taking photographs, you can use a burst mode, allowing you to take multiple photographs at once. This camera is easy to use, with just one button and a touch display feature. Another thing that makes this camera easy to use is that it has a voice control feature. Anyone with a strong accent will shy away from that immediately, but you don’t have to worry, strong accents have been taken into consideration when GoPro designed this product. Another thing that we found to be an excellent feature is the fact that this camera automatically uploads footage directly onto your GoPro Plus Cloud account, letting you immediately access footage from your phone. Related: Considering the GoPro HERO5 does not come with an internal storage, you’ll definitely want to think about purchasing an external storage option such as SanDisk 64GB microSDXC UHS-I Card alongside it if you want to be able to use the camera immediately after purchase. Description: The GoPro Hero5 Session Action Camera is actually quite similar to the GoPro Hero5 Black, but in our opinion it offers anyone new to action cameras an excellent opportunity to purchase a new camera with a great value. 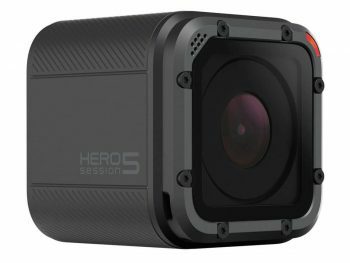 One of the few differences is that unlike the GoPro Hero5 Black is doesn’t feature a touch screen, although it does still feature GoPro’s unique voice control system. One of the best things about this camera is that it is incredibly easy to use, with just a single button that you have to press. Just like with other GoPro products, it is waterproof up to 33 ft (10 m), but you can increase this by purchasing a waterproof housing system. The housing system is a really good accessory to have, as it also protects the camera from dust. Another excellent feature is that it has an advanced wind noise reduction system, meaning that you will no longer hear the howls of wind that you barely noticed in your video footage. You can use your GoPro Plus Cloud account to access any photographs or videos taken on this camera immediately. Related: GoPro HERO5 Session works best in places with plenty of natural light, which means you would probably be taking shots outdoors very often. In that case, you’ll definitely find this Black Pro Basic Common Outdoor Sports Kit handy. 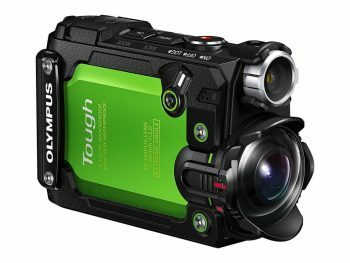 Description: The Olympus TG-Tracker Action Camera is one of the most unique action cameras on the market, this is because it is shaped to match an almost camcorder-like design. It is slightly heavier than the small box shaped alternatives on the market, but a lot of people prefer this design. It’s easier to hold when not mounted, and it still has the ability to shoot 4K video quality at 30 fps. One of the things that really make the Olympus TG-Tracker stand out against the GoPro alternatives is that it is waterproof directly out of the box up to 30 m. This means that you won’t require a waterproof housing unit for the vast majority of water sports, or other activities that you could take this camera with you on. Unless you plan on accidentally dropping it into the sea. You have a variety of recording options that are offered to you by this camera, including 4K at 30 fps, and 1080p at 60 fps. So whether you want to shoot at 30, or 60 fps there is an option available to you. This particular model comes with an Olympus TG-Tracker Case, a camera floating strap, and a high speed microSDXC. This microSDXC is fantastic for video footage, as it can write the footage fast enough without making it appear jerky and unpredictable. Related: Although the TG-Tracker is very easy to carry around because of its small size, it’s still unwise to carry it by hand all day, especially if you’re going to need your hands while hiking or trekking. Consider purchasing this Olympus CSCH-125 Custom Case for better portability. 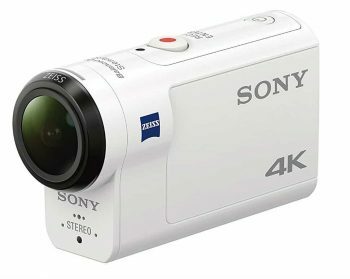 Description: The Sony FDR-X3000R Action Camera is one of the most popular action cameras for families, this is mostly because it really does look like a mini-camcorder. The design means that it is easier to hold without a mount, and it can be flipped open quickly and efficiently to capture quick moving images. It shoots in 4K Ultra HD, and it features a reduced shake in the footage due to a balanced optical steady shot system that Sony have developed. It is also one of the few action cameras currently on the market that allow you to zoom in on what you’re filming. The ability to zoom is quite a rare feature on action cameras, as it isn’t usually necessary. But, for families it could be just what you need for capturing that perfect moment. This camera can also be used underwater, it has a massive capability at shooting perfectly without a waterproof housing system until you are deeper than 60 m. So it’s an ideal option for water sports, as well as general activities. Related: The fact that Sony FDRX3000/W comes with built-in Wi-Fi and GPS that both work wonderfully is a good thing overall, but it’s bad news for the battery life. If you plan to take the camera on long excursions, you might want to have the Wasabi Power Battery as back-up if you happen to run out of battery outdoors where you can’t recharge. 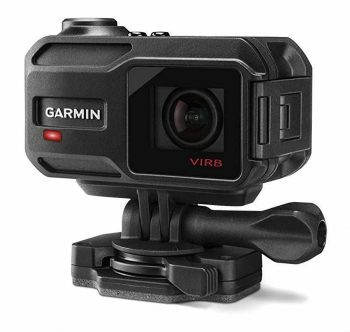 Description: The Garmin Virb XE Action Camera is a fantastic option for any traveler who is looking for a simple device that also comes with good value. While it can’t shoot in 4K, it’s ideal for the majority of people who do not have a device to stream 4K footage onto. There’s no point in having a 4K camera without a device to view your footage on, although most products being developed are 4K compatible. This camera has a built-in on-board system that measures everything from speed and elevation, to your heart rate and g-force. It also adds this information directly onto your video footage, so you don’t have to worry about proving how much effort you put into your ideal sport. Or how high up that mountain you hiked. This particular model is waterproof up to 50 m, so any bad weather won’t be an issue at all. It can also be taken for a light swim or dive with no hassle because you won’t need to attach any housing to it. Related: Garmin Virb XE’s battery life is quite admirable all things considered, but it still won’t be enough if you’re planning to take it on an outdoor excursion where you can’t plug in easily. Having this EforTek Replacement Battery as backup will quickly solve the problem, though. 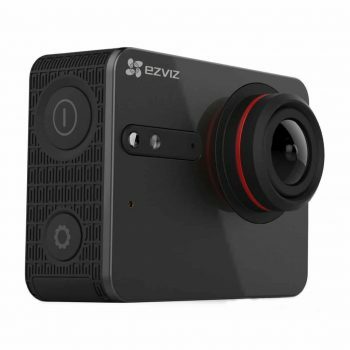 Description: The EZVIZ FIVE Plus 4K Action Camera is one of the most versatile cameras on the market, one of the reasons for this is the capability that it has when it comes to frames per second. Like most action cameras, it can only record 4K at 30 fps, but when the resolution drops, the fps are significantly higher than other models. The camera can record in 2.7K at 60 fps, and it can record in 1080p at 120 fps. It’s rare to find a camera that can handle such a high frame rate without producing stuttered video footage. This camera also offers not just several, but sixty different recording modes. These range from high-speed to slow motion, and everything in between the two. With this camera you can instantly watch the footage you have recorded on its 2” touchscreen, and you can even hear the crystal clear audio quality that it produces. This camera has been built for the extremes, and it can naturally handle more than the average action camera can, including temperatures below zero. Related: This action camera is designed to work with drones, so if you’re planning to film complicated scenes or if you’d like to take a bird’s eye view picture, this Cheerwing Syma X5SW-V3 Quadcopter Drone will do the job for you. Description: TomTom is a brand that most people will see as recognizable, but more for directions than action cameras. Yet, they have managed to bring a seemingly perfect action camera onto the market. 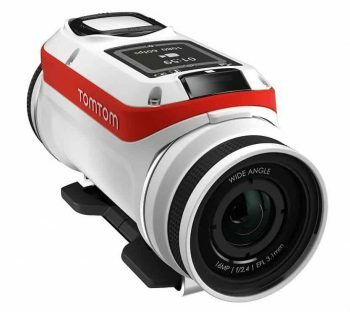 One of the best things about the TomTom Bandit 4K Action Video Camera would have to be its battery life. Most action cameras can only shoot continuously for just over an hour, whereas this camera can shoot continuously for 3+ hours. It also has built-in sensors. Just like with the EZVIZ FIVE PLUS 4K Action Camera, all of this information is recorded directly onto your video footage. So if anyone doesn’t believe how fast you were going, you can show them. You can also download an app for this product that allows you to instantly playback your footage, so you can make sure it looks just how you want it to before leaving an area. The premium pack also includes a remote control, a camera mount, a dive lens cover and a GoPro mount adapter. This means that you can use this particular camera with any of GoPro’s mounts and accessories. Related: The TomTom Bandit is quite durable in and of itself, but if you’d like to offer it an extra layer of protection, consider purchasing this DURAGADGET Shock-Absorbing Neoprene Case. With this, you’ll be able to take the camera on any traveling excursion without worry. So, when it comes to choosing your ideal action camera, you now know what exactly you need to look for. You need to make sure that it shoots in a high resolution, at a frame rate that you’re happy with. You also need to make sure that it is durable enough to survive your adventures. Just remember that the only thing you really need to focus on once you have found your ideal camera is your own imagination. When you can just pull a camera out of your pocket, you will be surprised at what you can find through the lens. So, if you already own an action camera, what do you enjoy filming with it? Or, if you don’t, what feature do you think you’ll find to be most important? Do you plan on purchasing any of the action cameras we’ve mentioned above? Do you have any other suggestions for us? Let us know in the comments below!